FILE - President Donald Trump speaks at Mar-a-Lago in Palm Beach, Florida, April 6, 2017, after the U.S. fired a barrage of cruise missiles into Syria in retaliation for a gruesome chemical weapons attack against civilians. When it comes to Syria, Donald Trump as a private citizen and as the U.S. president has voiced a wide range of often contradictory views. On Monday, he deplored the "atrocious" suspected chemical weapons attack that killed more than 40 people in Syria over the weekend. Trump said he would make "major decisions" within 48 hours about how the U.S. would respond, almost exactly a year after he ordered the launch of 59 Tomahawk cruise missiles to target a Syrian military base where jet fighters used in a similar chemical attack were stationed. FILE - In this photo made from the footage taken from Russian Defense Ministry official website April 7, 2017, an aerial view shows shelters for aircraft at a Syrian air base after it was hit by U.S. strike in Syria. Yet, less than a week ago at a news conference, Trump said, "I want to get out. I want to bring our troops back home," only reluctantly agreeing to the advice of military advisers to maintain the U.S. presence in Syria in the coming months. In 2013, two years before he announced he was running for the White House, Trump said on Twitter that the U.S. "should stay the hell out of Syria," asking, "What will we get for our lives and $billions? Zero." Later that year, Trump implored his predecessor, former President Barack Obama, "Do not attack Syria. There is no upside and tremendous downside. Save your 'powder' for another (and more important) day!" After Obama declared that if Syria crossed a "red line" and used chemical weapons, he would respond accordingly, and then let a suspected chemical attack pass without intervening, Trump said, "President Obama's weakness and indecision may have saved us from doing a horrible and very costly (in more ways than money) attack on Syria!" Trump often attacked Obama for supposedly telegraphing his military intentions by publicly discussing a timetable for the return home of U.S. troops stationed overseas. Now, Trump is being criticized for much the same thing, announcing his intention to bring home the 2,000 U.S. troops stationed in Syria as soon as possible. FILE - Sen. John McCain, R-Ariz., speaks to reporters on Capitol Hill in Washington, Oct. 31, 2017. 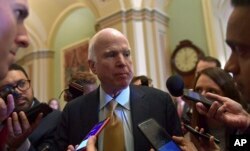 Senator John McCain of Arizona, a prisoner of war in the Vietnam War in the 1960s and the Republican party candidate in the 2008 presidential election, said that when Trump "signaled to the world that the United States would prematurely withdraw from Syria, [Syrian President] Bashar Assad and his Russian and Iranian backers have heard him, and emboldened by American inaction, Assad has reportedly launched another chemical attack against innocent men, women and children." White House press secretary Sarah Huckabee Sanders said it was "outrageous" to suggest that Trump had "green-lit something as atrocious" as Assad's chemical weapons attack. McCain called for a new attack on Syria, saying that Trump needs to "demonstrate that Assad will pay a price for his war crimes."